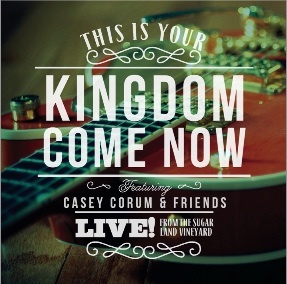 "This Is Your Kingdom Come Now" is wonderful, relaxing Christian CD featuring Casey Corum & Friends. The music was recorded LIVE at Sugar Land Vineyard Church outside of Houston. Vineyard Worship is a non-profit ministry of Vineyard Churches USA that seeks to help local churches experience God. For more information on Vineyard Worship along with acoustic guitar tutorials, live worship videos, and other bonus materials for "This Is Your Kingdom Come Now", check out their new website at www.vineyardworship.com. I used to listen to Christian artists a lot as a teen, like Carman, Amy Grant, DC Talk, Rebecca St. James, etc. Actually the only concerts I have ever been too were for Christian singers. But over the years I have veered away from Christian music. Why? I am not sure, it may be because we no longer attend church (if you want to know why read this post). But we are Christians and I do teach my children about the God and Jesus at home. So I signed up to review this CD because I was curious and wanted to get a taste of current Christian music since I have been out of touch with it for so long. After listening to the first 4 songs I remembered why I enjoyed Christian music so much as a teen. "This Is Your Kingdom Come Now" is relaxing, inspiring and simply wonderful. This CD is great for the entire family. The music style of this CD is R&B, gospel, and modern rock. I particularly liked the gospel songs. This dynamic new album features veteran worship leader and songwriter Casey Corum and a cast of friends recorded before a full house over two nights at Corum's home church. Listeners will also be introduced to the powerful voices of Torri Baker (Vineyard Church - Columbus, Ohio) and Crispin Schroeder (Northshore Vineyard - Covington, Louisiana), as well as a 17-voice gospel choir. Threads of R&B, gospel, and modern rock are woven together to create a fresh sound while, at the same time, being deeply rooted in the hallmark Vineyard worship value of intimacy with God. The CD release date is October 2, 2012. It can be purchased directly from Vineyard Worship for $11.99. Vineyard Worship has graciously offered to give away a copy of the This Is Your Kingdom Come Now CD to one lucky reader. Only the first entry is mandatory. Other entries are optional and give you extra chances. This giveaway is not affiliated with Facebook in any way. The winners will be posted on the blog and will be emailed. Winners must reply within 48 hrs with their contact information or another winner will be chosen. Prize will be mailed via the marketing company. *Disclaimer - I received a digital copy of the CD in return for my honest review. Regardless, I only recommend products or services I use personally and believe will be good for my readers. I am disclosing this in accordance with the Federal Trade Commission's 16 CFR, Part 255: "Guides Concerning the Use of Endorsements and Testimonials in Advertising." Please note that prices indicated in the post are subject to change. I was not compensated for my review and all opinions are our own! Many of the links found on my side bars and in my blog posts are affiliate links. As a result, I might get paid money and I will most likely spend the money on homeschool supplies. Thanks for offering this giveaway! This CD sounds like a great, well rounded music collaboration. I like almost all types of music. I guess the exceptions for me would be heavy metal & modern rap. I like so many different styles. My favorite would probably be Third Day.